In late March we published our new policy briefing Everywhere and Everyone Included? based on an analysis of data on NHS mental health trusts’ research activity and round tables with trust research and development managers. We found wide difference in how research active NHS mental health trusts in England are. This is despite the government’s commitments to create a “culture of innovation and research that is embedded at every level” of the NHS, with a “workforce that embraces research and innovation”. Every English mental health trust did take part in at least one study funded by the National Institute for Health Research (the body responsible for funding, promoting and supporting research in the NHS in England) last year. But, according to our analysis, after accounting for their size on some measures the top trusts are ten times as research active as the least. The briefing identified three reasons for spreading research activity across a wider range of trusts. People affected by mental health problems want to be involved in research and benefit from participating. This is not just because it provides them access to novel treatments. Participating in research provides many people with the positive experience of helping others who face similar challenges. Understanding research and the application of evidence should be a core part of every mental health professional’s training. Assisting on a study is an important learning opportunity for all professionals, and vital for developing the next generation of researchers. This is especially important in an area of medicine like mental health that has traditionally not had as strong a scientific or research orientated culture as others. There are well documented problems with recruiting participants to take part in studies. If we are to achieve the increase in mental health research that is needed we will have to expand the pool of potential participants. In our discussions with research and development managers we identified several barriers to spreading research. Unsurprisingly the lack of funding, especially from commercial and charitable sources, was a strong theme. This is something that public sector funders and the government need to take account of, either directly in their funding decisions or by taking steps to catalyse more private and charitable funding. Perhaps as important was the fact that a research programme requires upfront investment, to develop the bids needed to win grants and to put in place the facilities and staff needed to deliver studies. The universal view was that the grants available for publicly funded research do not cover these overheads. If there was clear evidence that by investing in research trusts would improve other aspects of their performance, it would be likely to influence trusts’ leadership. However our analysis of CQC inspection scores and patient satisfaction surveys, key measures trust chief executives and boards are judged against, found no obvious relationship between them and how research active a trust is. This is not to say that there is not a relationship. There is growing evidence of the wider benefits of research within healthcare providers, both for patients and professionals. Even if there weren’t, ultimately it is only through research and development that the solutions to the challenges people affected by mental health problems will be found. But until we are able to build a more robust evidence base we concluded that it will be difficult to persuade individual trusts to invest heavily in research at a time they are dealing with falling funding and rising demand for their services. So if it is to create the promised ‘culture of innovation and research’ in NHS mental health services, the Government will need to provide stronger national leadership and incentives to spread collaborations beyond existing networks. NHS and beyond can do. We need to find ways to attract more funding for mental health research, public, charitable and private. We need to work together to excite more service users and professionals about the possibilities of research and make it easier for them to find out about opportunities and to ask to get involved. Creating grassroots demand for research opportunities will make it harder for the case for investment to be ignored. The briefing Everywhere and everyone included? 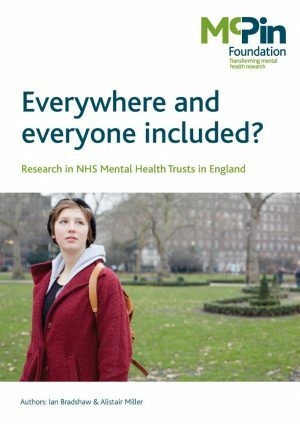 Research in NHS Mental Health Trusts in England is available to download now.